We make sure each of customers is 100% satisfied with the service and products! We offer free consultation and can help you pick the perfect set for your windows. Have your shades cut to the perfect dimensions and a design that suits your preferences. 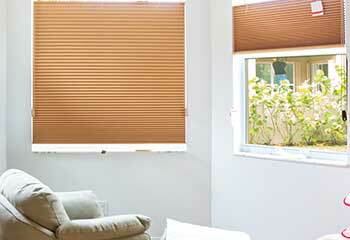 All of the blinds we offer are made by trusted manufacturers and top brands. 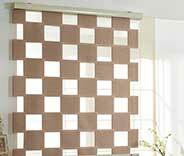 A wide range of classic and modern blinds and shades for your home and office! If it's good enough for an emperor, it might just be good enough for your property. Roman shades have a lot of benefits. Click here to learn what those are. 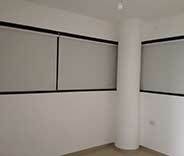 A great and inexpensive way to enhance the energy efficiency of your property is to install cellular shades. These window coverings are very versatile and can easily complement the décor of any room. Learn more here. An excellent way to protect the interior of your home or office from harmful UV rays without sacrificing natural lighting is sheer shades. Keep your furniture and your eyes safe with these unique window coverings. 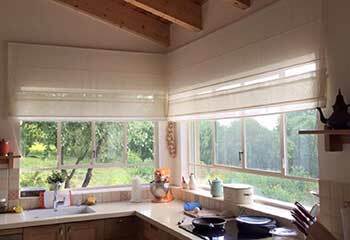 Layered shades are very unique and offer versatile design options while also providing UV protection and privacy. Click here to find out more about these window coverings. Sometimes all you need is a classic. Roller shades have long since been the staple, nay, the apotheosis of window coverings. Click here to learn more about them. Why bother getting up? You can draw the blinds by simply pushing a button. At least, you'll be able to do that after you get new motorized shades installed. Read more here. Your office deserves beautiful looking window treatments, so don't neglect it. From motorized units to cordless options. There's a fit for every need. 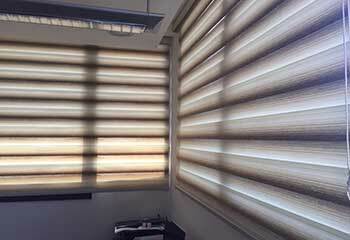 Click here to learn more about blind and shade options for commercial buildings. Looking for window treatments for your home, office, or practice? Sherman Oaks Blinds & Shades has them all, in countless colors, material and other options. Trust us to deliver premium products to your doorstep at an affordable price and a minimum 5-year warranty for your peace of mind and comfort for years to come. Our team will work hard to accommodate your budget, and our inventory holds both higher end, custom window coverings such as Roman shades, as well as more affordable treatments including faux wood blinds and aluminum blinds. 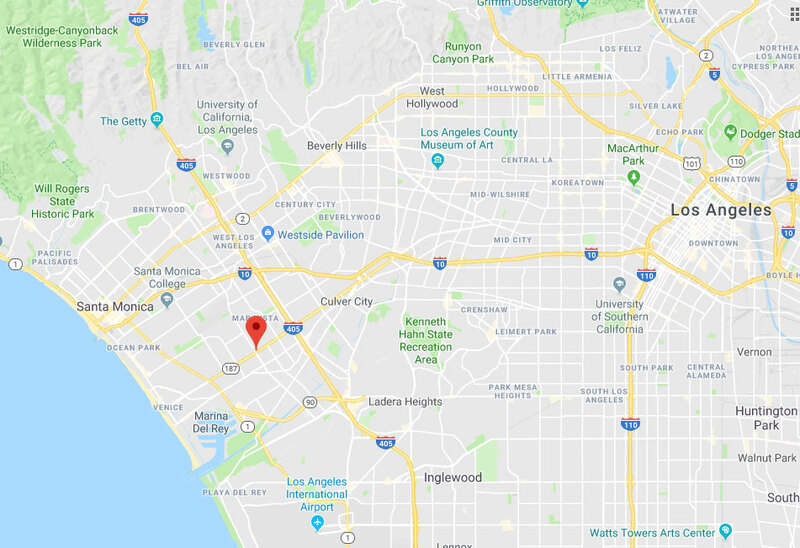 You can rest assured your covering will arrive to your door in a prompt manner, whether you live or work in West Hollywood, Burbank or San Fernando. Maybe your office window in Santa Monica is too high to reach and adjust every day or you're looking for an automated solution in your Beverly Hills home. Either way, our stock holds several pioneering operational systems that will make adjusting your shades quick and easy. You can call our friendly team to learn more about motorized shades today! Commercial blinds and shades do so much more than just increasing the aesthetic appeal of your interior. With the right covering, you'll be able to keep heat at bay, reduce glare, and decrease the effect of damaging UV rays, all of which will result in improved team productivity and comfort. Your products and flooring remain protected from these adverse effects as well, and you might avoid costly repairs and renovations down the road. Finally, you'll be able to obscure the view of your operations from curious eyes and make your team feel more secure and protected. Sherman Oaks Blinds & Shades works around the clock to answer all your questions and concerns regarding our products and your needs anywhere in Culver City and the nearby area. From custom solutions that fit your window dimensions and feature requests to help in finding the right color and material for your ambiance, they will be there for you. No project is too big or small for us, so it's best you give us a ring explaining your intentions and start from there. Feel free to get in touch today and let us help you find a smart and beautiful solution for your windows in no time. 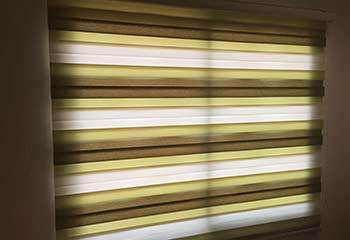 Our experts at Sherman Oaks Blinds & Shades are the team to call for friendly, professional window coverings at the most reasonable prices in town. With our top-quality selection, you're sure to find the perfect blinds and shades that will add a distinctive flare to every room, and priced to fit your budget. Feel free to browse our website for more information, and schedule your free consultation anytime! Find out everything you need to know about our range of quality blinds in our latest projects page. Get the perfect blinds for your rooms today! We helped this customer create a warm reading nook enhanced by eco-friendly window covering. Learn more here. Click here to see how we helped this customer choose an affordable UV protection for his home. Our customer wanted to minimize the time needed to open and close shades in his home. Click here for more details. Our team provided this customer with the beauty of a sheer and the privacy of a shade. Learn more here. I had no idea which blinds to get for my bedroom, but the extensive range I found on your website really helped. After getting the free samples I ordered, making a decision was really easy. Long story short – great service, good price, amazing blinds. Thank you! I was really impressed with your projects and decided to give you a go. The consultation was professional, and our new roller blinds look great. Good prices, great products. The fact that you do free color samples really helped me decide on the ideal color for the blinds I wanted in my kitchen. Your consultant was really professional, the price was really affordable, and the installation also went smoothly. Thank you!